U.S. 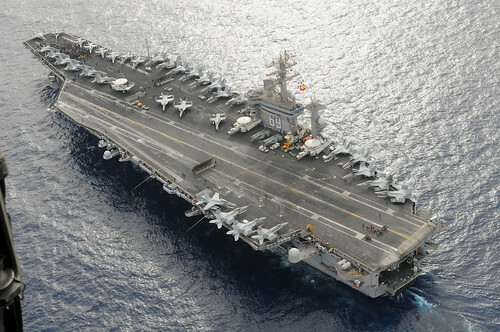 Sailors aboard the Nimitz-class aircraft carrier USS Dwight D. Eisenhower (CVN 69) gather at the bow of the ship for a foreign object debris walk down June 26, 2010, while under way in the Arabian Sea. The Eisenhower Carrier Strike Group is deployed as part of an ongoing rotation of forward-deployed forces to support maritime security operations in the U.S. 5th Fleet area of responsibility. This entry was posted on Tuesday, July 6th, 2010 at 9:57 am	and is filed under Military. You can follow any responses to this entry through the RSS 2.0 feed. You can leave a response, or trackback from your own site.